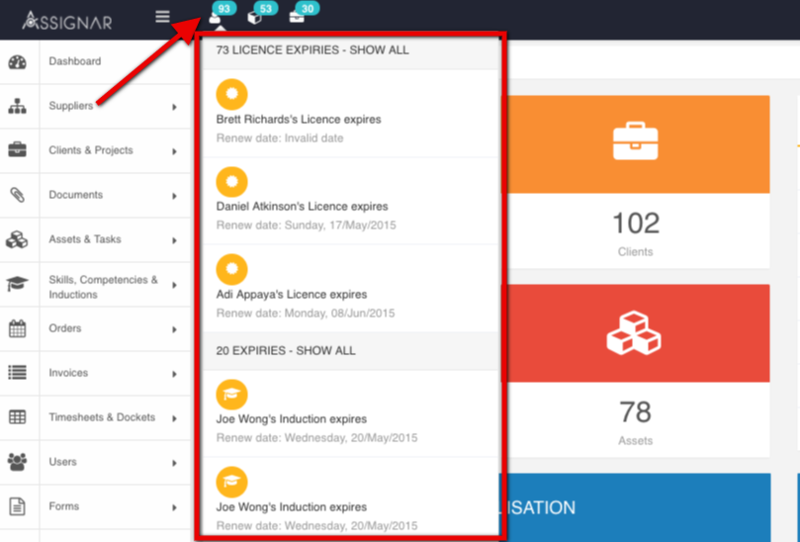 Through the Expiry Alerts Report, keeping track of expiries in the dashboard has never been easier. 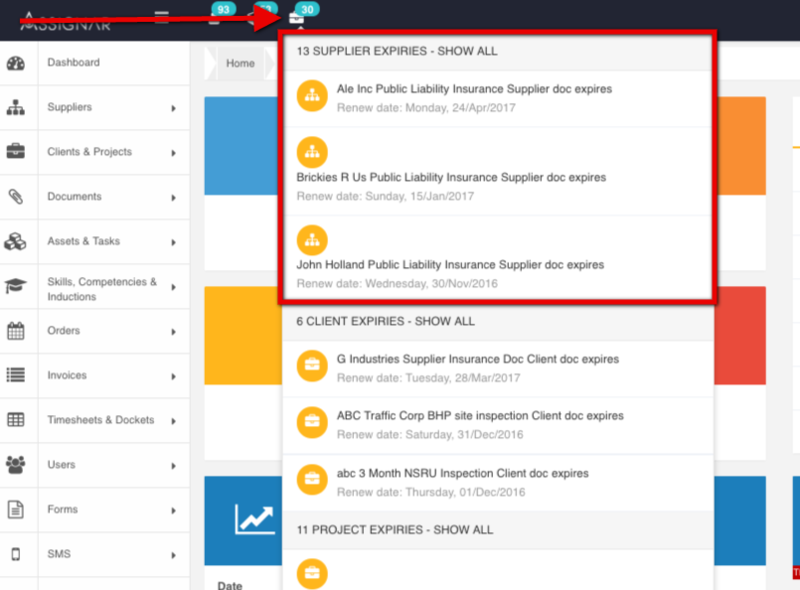 If you've set up any competency/induction expiries for your field workers, document expires for assets, asset attachments, supplier, client and/or projects, all these expiry alerts can be found together in the expiry alerts report. There alerts or flags then can prompt your staff to take action and renew these or follow the next step in your current internal workflow process. Each of the above are split into different tabs in order to differentiate between each module. Competency expiry alerts tell you when a fieldworker’s competency (licence or certification) has expired or is expiring soon, so that you can update these in time. Click on the Licence/Induction Expiries icon in the top menu bar. Click on one of the fieldworkers in the dropdown menu. This will take you to the Fieldworker details screen where you can edit fieldworker competencies by updating the expiry date and attachment, or SMS the fieldworker asking them to update via the Fieldworker App. 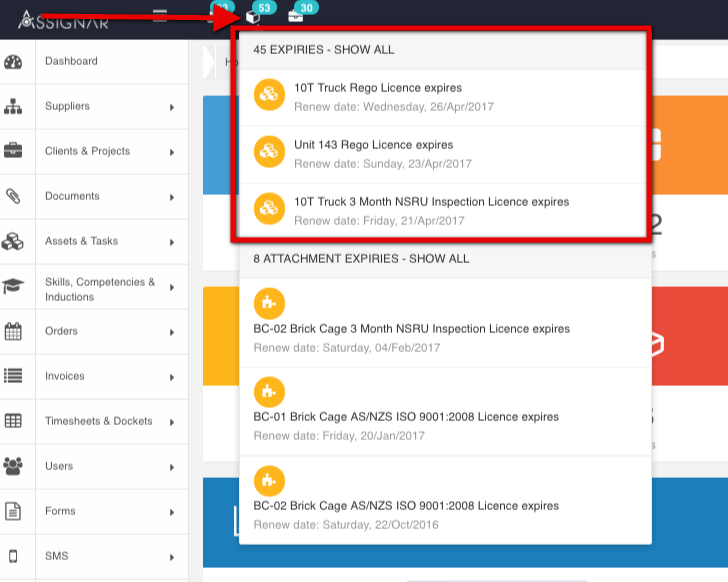 Click on the Licence/Induction Expiries icon > Show all licence expiries in the top menu bar, or Reports > Expiries in the side menu and select the Competencies tab to view all expiring or expired competencies. Click the Renew button next to a fieldworker in the list. This will take you to the Fieldworker details screen where you can edit fieldworker competencies by updating the expiry date and attachment. Or you can choose to SMS the fieldworker by clicking 'Send SMS' to ask them to update this via the FieldWorker App. A 'View Conversation' button is also available, so you can see their responses to any messages you have sent about updating their competency. Induction expiry alerts tell you when a fieldworker’s induction has expired or is expiring soon, so that you can update these in time. Click on one of the inductions in the dropdown menu. This will take you to Users > Fieldworkers > Manage Competencies where you can update the induction expiry date and attachment (if required) or SMS the fieldworker asking them to update via the Fieldworker App. 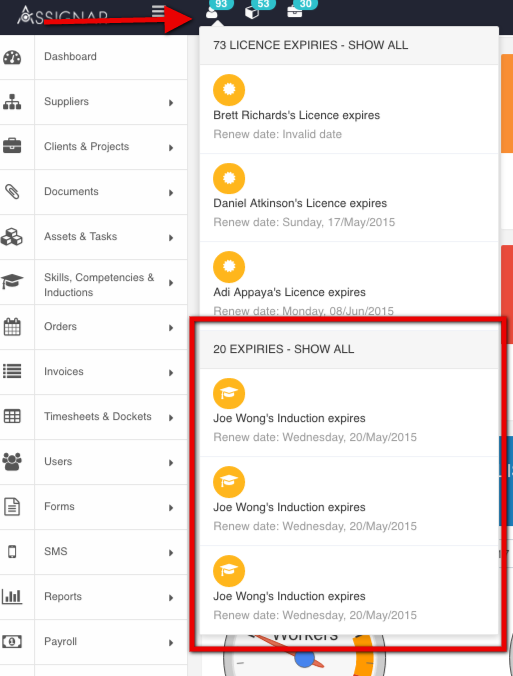 Click on the Licence/Induction Expiries icon > Show all induction expiries in the top menu bar, or Reports > Expiries in the side menu and select the Inductions tab to view all expiring or expired competencies. Click the Renew button next to a fieldworker in the list. This will take you to the Fieldworker details screen where you can edit fieldworker inductions by updating the expiry date and attachment. Or you can choose to SMS the fieldworker by clicking 'Send SMS' to ask them to update this via the FieldWorker App. A 'View Conversation' button is also available, so you can see their responses to any messages you have sent about updating their induction. Asset expiry alerts tell you when an assets document has expired or is expiring soon, so that you can update these in time. Click on the Asset Expiries icon in the top menu bar. Click on one of the assets in the dropdown menu. This will take you to Assets & Tasks > Assets > Edit where you can update the document expiry date and attachment. Click on the Asset Expiries icon > Show all asset expiries in the top menu bar, or Reports > Alerts in the side menu and select the Assets tab to view all expiring or expired asset documents well as any disabled asset documents. Click the Renew button next to a document in the list. This will take you to Assets & Tasks > Asset Attachments > Edit where you can update the document expiry date and attachment. Asset attachment expiry alerts tell you when an asset attachment document has expired or is expiring soon, so that you can update these in time. Click on the Asset Attachment Expiries icon in the top menu bar. Click on one of the assets in the dropdown menu. This will take you to Assets & Tasks > Asset Attachments > Edit where you can update the document expiry date and attachment. Click on the Asset Attachment Expiries icon > Show all asset attachment expiries in the top menu bar, or Reports > Alerts in the side menu and select the Asset Attachments tab to view all expiring or expired asset attachment documents well as any disabled asset attachment documents. 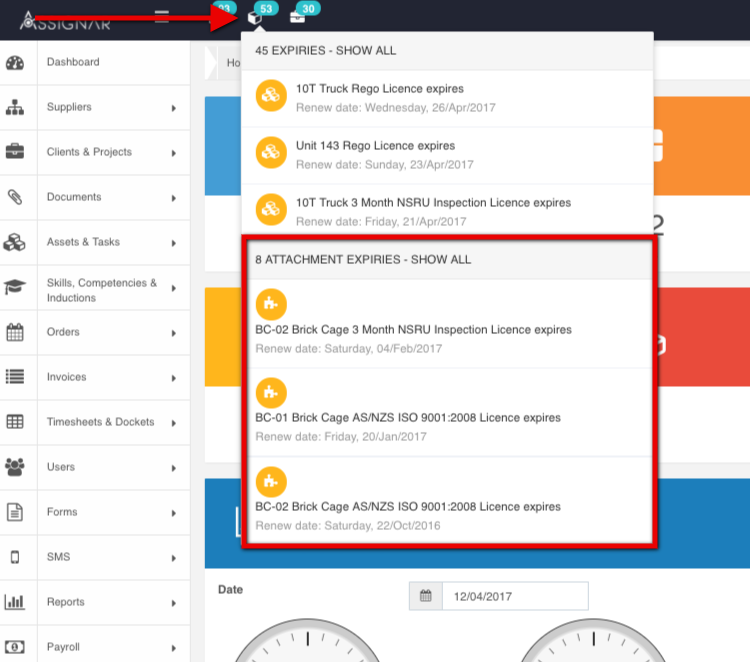 Supplier expiry alerts tell you when a supplier document has expired or is expiring soon, so that you can update these in time. Click on the Supplier/Client/Project document Expiries icon in the top menu bar. Click on one of the suppliers in the dropdown menu. This will take you to Suppliers > Suppliers > Edit where you can update the document expiry date and attachment. 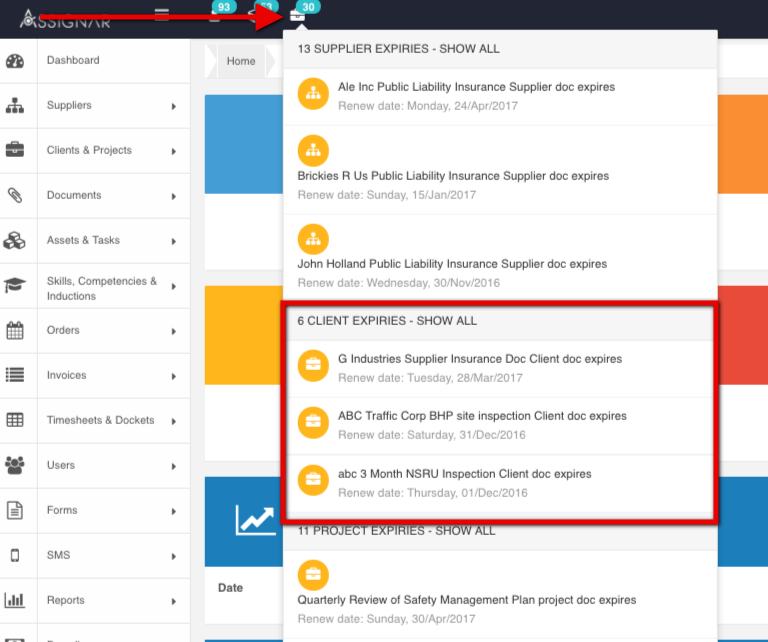 Click on the Supplier Expiries icon > Show all supplier expiries in the top menu bar, or Reports > Alerts in the side menu and select the Suppliers tab to view all expiring or expired supplier documents well as any disabled supplier documents. Click the Renew button next to a document in the list. This will take you to Suppliers > Suppliers > Edit where you can update the document expiry date and attachment. Click on one of the clients in the dropdown menu. This will take you to Clients & Projects > Clients > Edit where you can update the document expiry date and attachment. Click on the Supplier/Client/Project document Expiries icon > Show all client expiries in the top menu bar, or Reports > Alerts in the side menu and select the Clients tab to view all expiring or expired client documents well as any disabled client documents. Click the Renew button next to a document in the list. This will take you to Clients & Projects > Clients > Edit where you can update the document expiry date and attachment. Click on one of the projects in the dropdown menu. This will take you to Clients & Projects > Projects > Edit where you can update the document expiry date and attachment. 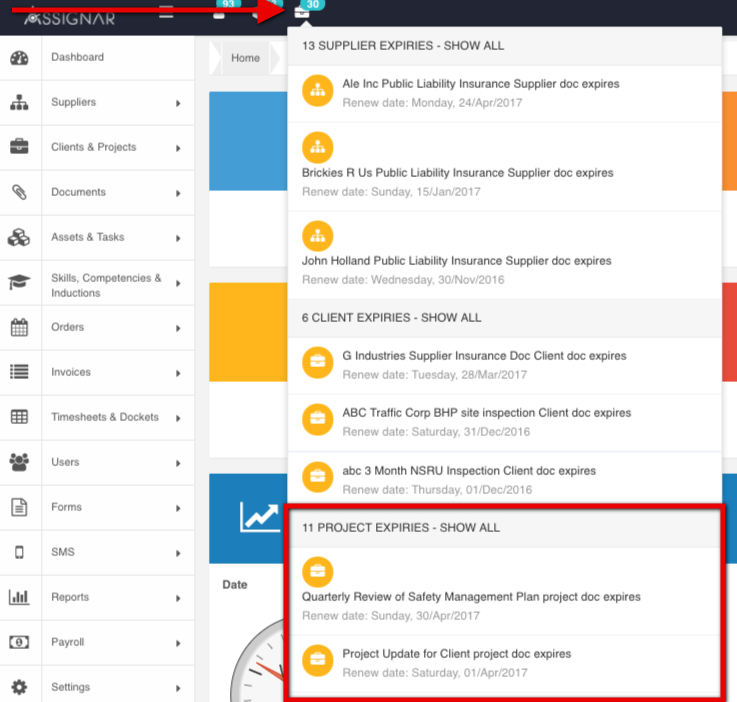 Click on the Supplier/Client/Project document Expiries icon > Show all project expiries in the top menu bar, or Reports > Alerts in the side menu and select the Projects tab to view all expiring or expired project documents well as any disabled project documents. Click the Renew button next to a document in the list. This will take you to Clients & Projects > Projects > Edit where you can update the document expiry date and attachment.